Crowds of constituents made their way to City Hall to watch San Francisco’s 43rd Mayor be sworn into office. 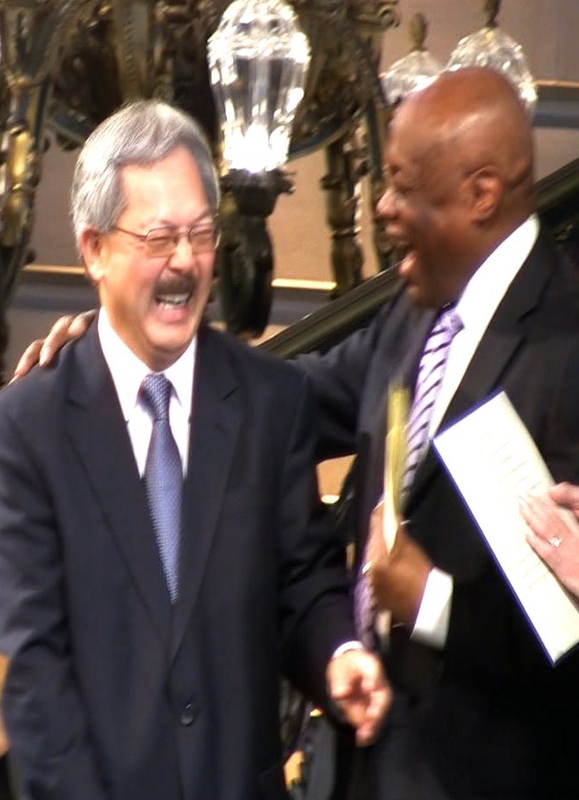 Viewers were four and five rows deep leaning off balconies for a vantage point to see Mayor Ed Lee take the oath of office administered by Senator Dianne Feinstein. People were hanging over yellow taped off areas that were technically designated for heavy lighting equipment — with their iPhones and iPads dangling. I managed to inch my way to the top of the stairs to capture these memorable moments with the Mayor, Senator Feinstein, former Mayor and Lt. Governor Gavin Newsom, and Master of Ceremonies and former San Francisco Mayor – Willie Brown. Diane, yours is a good coverage of the inauguration ceremony of SF’s new mayor. Now let’s wish the new mayor good luck.